Borderlinx | Buy Modcloth and ship worldwide with Borderlinx. Cheap rates guaranteed. Find clothing as unique as you at Modcloth USA! Celebrating vintage, classic looks with a modern edge, Modcloth USA fashion is sure to help you be seen and remembered, whether you're putting together a work outfit, having a night out, or hitting the beach. Offering looks from soft and demure to bold and adventurous, Modcloth USA has rapidly become incredibly recognized for its distinctive and well-loved styles and range of sizing options. From apparel, to shoes, to accessories, to home items and more, explore something to expand and highlight your personal style and individuality today! Modcloth USA is the perfect place to shop for clothing, footwear, accessories, and more if you're looking for a wonderfully vintage look with a dash of modern excitement. Customers who love the distinctive Modcloth USA styles don't have to stop at their personal wear; also available are items for your home or apartment as well, such as pillows, lighting, clocks, curtains, and more! Even offering accessories and toys for pets, Modcloth USA products include items for nearly every room in your home. With many items available for under $50 or even $20, there's something for everyone at Modcloth USA. 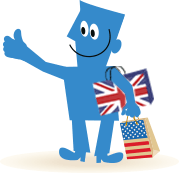 Now with Borderlinx, customers internationally can buy Modcloth in the USA! Borderlinx calculates cheap shipping, tax & duties upfront using our shipping cost calculator, and will ship your order to your home country. Additionally, a number of services are available through Borderlinx to make international ordering from Modcloth USA hassle-free, including concierge, free repacking and consolidation!